This post contains spoilers for both the Vampire Diaries and The Originals. All I ever wanted was for Klaus' words to ring true. "Perhaps one day, in a year or even in a century you'll turn up at my door and let me show you what the world has to offer." I like to think Julie Plec and Kevin Williamson had every intention of making good on these words, but casting changes thwarted their grand plans. Nina Dobrev left the show in season six, thus spurring the butterfly effect. 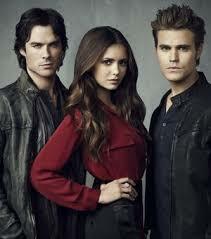 Originally Elena was supposed to circle back to Stephan. Don't believe me, check out this article by Teen Vogue. With Elena out of the picture and no one left for the Salvatore brothers to fight over, Stephan needed a new love interest. Pairing Caroline and Stephan never made any sense to me. If anything, let Caroline and Tyler go another round if you really needed a love story. Better yet, bring back Jeremy instead of developing the Enzo-Bonnie thing. That was weird. So for better or worse, Caroline and Stephan are in love and its epic . . . somehow. He dies and Klaroline fans rejoice. There is still hope. No there isn't. Apparently it wouldn't be right for Caroline's one true love to be Klaus. Don't believe me, check out TVLINE interview with Julie Plec. With Klaroline dead in the water, I suppose that opened the door to the ultimate demise of original vampire Klaus Mikaelson. Sure it made for a dramatic ending and allows Plec and Williamson to develop Legacies character Hope Mikaelson without either of her parents swooping in to save the day, but I feel robbed of my happily ever. So here's to you Klaroline fans, courtesy of Caroline J.